XUZHOU, China, March 28, 2018 /PRNewswire/ — XCMG, the world’s leading construction machinery manufacturer, has delivered 70 units of its XDA40 articulated dump truck to customers in Central Asia and South Africa, completing an export order that is worth 200 million yuan (USD 31.63 million). Designed for use in major mining projects and capable of handling loads of up to 40 tons, the advanced and durable XDA40 articulated dump truck is XCMG’s flagship model. Highly adaptable so as to meet the needs of clients all around the world, the 70 units in this major order have been customized to client specifications and will see service in major projects located in varied climates and terrains across two continents. 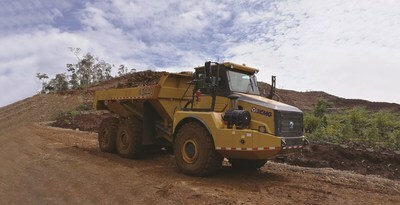 “This RMB 200 million export order has set a new record for articulated dump trucks. It represents XCMG and China’s strength in high-end equipment manufacturing and is a milestone on China’s path to global dominance in the global mining equipment market,” noted Wang Min, Chairman and President of XCMG. “In 2017, XCMG’s Excavator Machinery Business Department export volume grew by 150 percent year-on-year. Our mining equipment has amazed the global market with its brilliance and broken the monopoly of foreign brands. In the future, we will continue to strive to reach the peak of the industry and remain a world-class mining equipment brand,” added Wang. As a pioneer and leader in the Chinese construction machinery industry, XCMG has adopted an innovation-driven strategy to achieve continuous breakthroughs in technology and product development. The group has recently completed a high-end production line featuring 70-700 tonnage hydraulic mining excavators, 60-360 tonnage mining dump trucks and 30-60 tonnage articulated mining dump trucks, making XCMG one of the few manufacturers in the world and the only one in China that’s capable of developing and manufacturing large set mining equipment for open-pit mining. XCMG is a multinational heavy machinery manufacturing company with a history of 74 years. It currently ranks eighth in the world’s construction machinery industry. The company exports to more than 177 countries and regions around the world. For more information, please visit: www.xcmg.com, or XCMG pages on Facebook, Twitter, YouTube, LinkedIn and Instagram.